A year ago, Roswin was an unremarkable settlement at the edge of a forest, its people making their livings primarily by hunting, trapping, and farming. Now, it’s a town trapped in a nightmare—literally. At the center of the town’s problems is a boy named Jaik who was born with great innate psychic potential. But Jaik had a hard and miserable life, and never had the chance to consciously develop the abilities he could have had. His days were filled with toil and pain, and his nights were filled with nightmares—but thanks to his psychic potential, those nightmares had power, and every night he was unknowingly forging a link to the darkest parts of the Dimension of Dreams. Still, nothing might have come of this had it not been for an ambitious night hag named Kabus who noticed what was happening and decided to take advantage of the situation. Coveting more influence in the Material Plane, she used strange rituals to tap into and build upon Jaik’s connection to the Dimension of Dreams, strengthening it and broadening it until the Material Plane and the Dimension of Dreams overlapped. Now Roswin essentially exists on both planes at once. Nightgaunts, vooniths, and other fell monsters of dream roam the streets, and those inhabitants who didn’t manage to flee the village before it was too late have themselves been transformed into monstrous nightmare versions of their former selves. The buildings are twisted and distorted in ways that defy normal geometry, some of them now larger on the inside than their exterior dimensions. The link to the Dimension of Dreams is still fueled by Jaik’s dreaming, and Kabus has woven an enchantment to keep him perpetually asleep in what had been the manor of the town’s reeve. Kabus herself makes her lair in Roswin’s only inn, the Dart and Dagger, now, like the rest of the town, warped and distorted into a weird dreamscape. What happened to Roswin is only the first step in Kabus’s schemes. The area of superimposition between the Material Plane and the Dimension of Dreams is spreading, and threatens to envelop other settlements if it isn’t stopped. The only way to sever the connection is to wake Jaik from his slumber, or kill him—but Kabus and her agents keep the sleeping boy hidden and well guarded to make sure he isn’t disturbed. Congratulations, Jeffrey. Putting yourself out there to compete in anything is hard, and designing RPGs is hard. Particularly designing adventure settings or locations. You have to be able to suggest some ideas about personalities, plots, terrain, and more, and have GMs chomping at the bit to add your location to their regular game. Let's see how you did! I believe in positive feedback and honest criticism that should make you better at every part of this gig. So to start positively, I want to say that THIS is an adventure location! You've given us a plot, a villain, and raised the stakes by saying the nightmare realm threatens to expand. You even threw in a sad story and a moral dilemma. I can work with this! I encourage you to strengthen the tone of your writing. A bit more elaborate description would serve you once you practice and find a more descriptive voice. Diligently expand your vocabulary and make the language more engaging. Tavern map is serviceable but why not think bigger? A town map labeled with intriguing titles—warped versions of mundane thing—would feed my imagination and broaden the feel of the whole thing. I wrote a spell for Horror Adventures called "dreadscape" and this is exactly the sort of thing I had in mind. Nightmarish reflections of everything around you working against your sanity and imposing fear while you try to work your way through a realm fueled by the darkest corners of your imagination. Great work and good luck in this contest! The text does a great job of describing Roswin’s history and the cause of its current calamity. You’ve defined the main villain in the night hag Kabus, and you’ve identified other potential threats the PCs could face while adventuring in Roswin. As the featured location, the Dart and Dagger Inn receives enough of a mention that the map doesn’t make me scratch my head in wonder, but I feel like you could have used some of your text to describe localized distortions specific to the inn. I also think Jaik should be in the inn (perhaps hidden in one of the barrels that serves as a large enough space to hold a bedroom), since you’ve chosen to highlight it. The map is somewhat reminiscent of The Dancing Hut, an adventure from the very early days of Dragon Magazine. In the adventure, the interior of Baba Yaga’s hut is a tesseract, so mapping was insane because rooms didn’t connect as expected. I like how the layout doesn’t make physical sense, and I appreciate the way you’ve indicated how the rooms fit together. I would have liked more leaning into the concept of warped reality, and I feel like you could have replaced the tables with beetles (or some other odd object from your selection of map icons) on the map. The text is clear enough, but it has some passive voice (For example, “His days were filled with toil and pain, and his nights were filled with nightmares” could become “Toil and pain ruled his days, and nightmares dominated his sleep,” and the text after the em-dash would start a new sentence). You have some filler words here and there (for example, you could remove “essentially” from the first sentence of the third paragraph without losing any meaning). Overall, this is a fascinating location, which you could have enhanced with more specifically directed information on the inn. By tightening up your text, you would give yourself plenty of words to do so without losing any of the other description. I’m on the fence for a recommendation, but I lean slightly toward recommending this to advance. This nightmare-plagued town is an excellent adventuring location, one that could easily be scaled up to allow for harder adventures or kept at a more reasonable level for something earlier in a campaign. The history of the town is clear, as well as the peril that it's in now, along with a solid villain. This has all the essential elements of an adventure that's all but written itself. I like that you call out the reason for the Dart and Dagger to be spotlighted (and I like the name; I'm curious if there's a story behind it as to me it screams rogues) and the overall entry leaves me wanting to see the map of the town reeve's manor too. That's solid work. I really like the map itself. I do wonder if the choices might be too big, in that usually a building that uses more than a single map (which this would need as you've indicated it also has a second floor and a cellar) is really large and this has all of four rooms on the first floor. That said, I like the shapes being nonrectangular and I love that it's nonlinear in terms of doors not opening into expected areas. I do wonder whether it needed a little inset about what it looks like from the outside, as that's not going to match what the map shows (as the text indicates happens in Roswin) -- where are the kitchen/pantry/private dining room when viewed from outside. Beyond that, I think the first floor may be a little too crowded, as it would be nearly impossible to have a fight in that main room, since there's no space for PCs to move around. Even the private dining room might only need a single table. Despite those concerns about the map, I think the overall flavor of this location is great, and it's easy enough to see an adventure set here. I do recommend this for advancement. In addition, I'm naming this entry my favorite of the round! Just wanted to say congratulations on a really strong entry for round 2. This is a creepy and exciting location and I can clearly see what sort of adventure we have in store. With the map, I wanted to say that I particularly loved the fact that the room connections do not map. It really highlighted for me that the inn had been twisted by nightmare/dream logic and I can imagine it driving players trying to map the place around the bend. Excellent work completing Round 2. You've shown that you not only had the imagination and creativity to get noticed by the judges, but that you are able to complete a goal in a short time. First, from the standpoint of whether a cartographer can understand you map, it's basically done from layout view. The only thing needed might be a clarification of the room connectivity. I think I would have preferred you to use some of your backstory space to actually describe the inn (the traps, the interaction between doors and rooms, what might be in the cellar or upstairs since those aren't shown). I can make the connection that Door B behind the bar probably connects with Door B in the kitchen, etc. but I know that sometimes others might be confused and a simple example or statement other than the inn is warped in dimension amidst the grand description of the town might be needed. Second, from the standpoint of an exciting or adventurous map location, I just don't see it. What I see is a main room, filled with tables and some fireplace traps and a kitchen. I see nothing strange or nightmarish (other than for anyone trying to move or place NPCs around or on all those tables) about the location that would set it apart from just a normal inn shaped like that (and I don't even know what parts of the tavern are different from its normal layout.) That basically leaves a GM like me trying to use the apparent 'warped door' effect of a fight that has an enemy run from the bar into the kitchen, through the kitchen to come out in the south end of the main room (through Door C) and base a fight or encounter on that being exciting more than once during a fight or utilizing 15+ tables (which could be cool if the floor was lava, or carpets of beetles or nasties, and everyone had to leap from one to the other, but that's not indicated). At its base, for me, I see one interesting-shaped room, with a bar that might be used for cover and some fireplace traps for interesting battle effect and a zillion tables which I don't know if they are intended as someone's nightmare shaping or you just tried to fill every space on the map and it wasn't intended. When I look at the map, I see the front door, so we assume the encounter will start there with a few possible variant, like the PCs coming in one of the few windows elsewhere in the room. From there we have a few tables and the bar right in front of them, where an enemy could be placed for cover. One fireplace trap presumably will effect any PC moving to the bar and another if the go a bit southward. 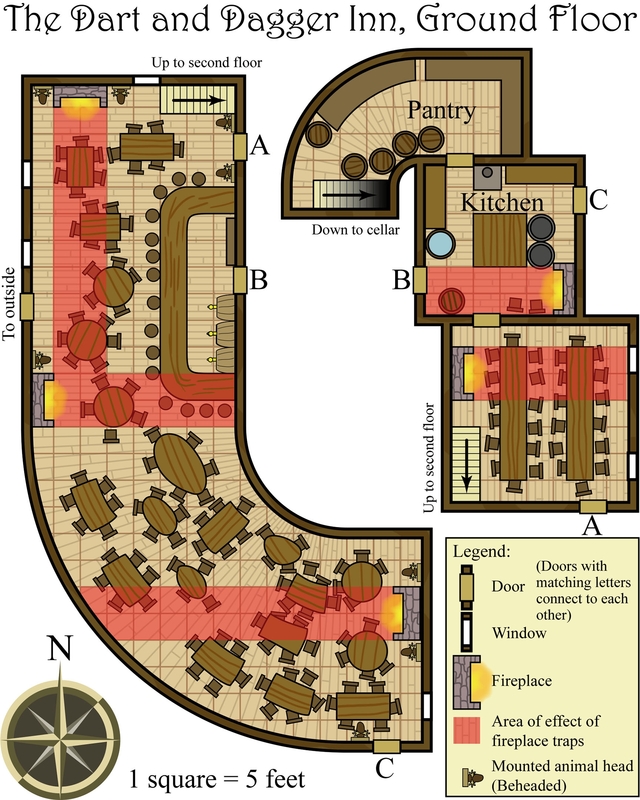 Other than that, the whole southern curve of the room doesn't need to be traversed unless you place enemies down there, who might flee through C to the kitchen (which can be reached through B behind the bar). and then you have access to the second floor right there next to the bar, so that probably rules anything important or hard to get from being up there. I tend to judge a map on its merits with supporting text to help me view it. You've written an adventure premise, but devoted only two sentences to the map you've shown (and only one floor of that map). To me, this tells me that you view this location as important and critical to one of the exciting parts of the location you've described (that and your map name is the Town of Roswin, but the map is the Dart and Dagger Inn, which is what I would have called the entry, but whatever). As mdwelham mentioned, Jaik isn't even here, and a good amount of the night hag's resources and agents should be devoted to keeping him hidden and well-guarded at the Reeve's manor. Why isn't the map there? All we know for sure is that the night hag stays at the inn (but that doesn't mean she'll be here, she could be watching Jaik because there's a band of PCs wandering around). This might be a good place to ambush or lure the PCs. Also, from your description, killing or driving off the night hag has no bearing on the premise (barring the PCs needing something only she has to end the sleep enchantment, which should be mentioned if that's the case, otherwise a GM could just let a dispel magic or dispel evil work and, chase down the hag later). I'd have preferred more use of the description to talk about things that make the map exciting; what might the fireplaces do, any importance to the mounted animal heads, rifts or gaps in the floor that send a PC elsewhere or spew something,etc. You have about 16 tables in here, and seating for about 113 people, not counting the bar stools. I don't know how big Roswin is, other than it's an unremarkable settlement and can't be that big, or they'd probably have a few heroes themselves, but that's a lot of seating unless this place is commonly used as the town hall too. Otherwise, the map also looks ordinary. You've opted for color, but everything is a cheerful, cozy wood color, there's nothing to indicate 'weird spots' or purplish-yellow bruising on the floors or walls. Additionally, other than a curved common room and pantry (which probably won't come into play in the encounter), I don't know if that's a nightmare twisting of the original layout or just how the tavern looked. Granted, you couldn't be expected to use map space to show the original layout (if different), but as a viewer seeing something that might be nightmarish, it should be recognizable as a horrific twisting of something that should be familar and at least make sense in some way. Ie. the previously mentioned 20 tables in one room, 5 fireplaces in basically 3 rooms (at least have the kitchen and adjoining private/conference(?) room share a fireplace on one wall for a semblance of realism), no way for the bartender to come around the bar without walking through the kitchen and out a door (which we don't know where would lead to normally), etc. If we're to assume that these are nightmare additions... we're left wondering how nightmarish this place can be where a bunch of tables, extra fireplaces, and a curved room are considered nightmares. Good stuff! This was a strong entry. I like how all the elements, the town, encounter, and villain, are tied together succinctly. I also like the implied moral choice of adventurers possibly having to kill Jaik to save the town. Well done.